Champaign mayoral candidate Azark David Cobbs. 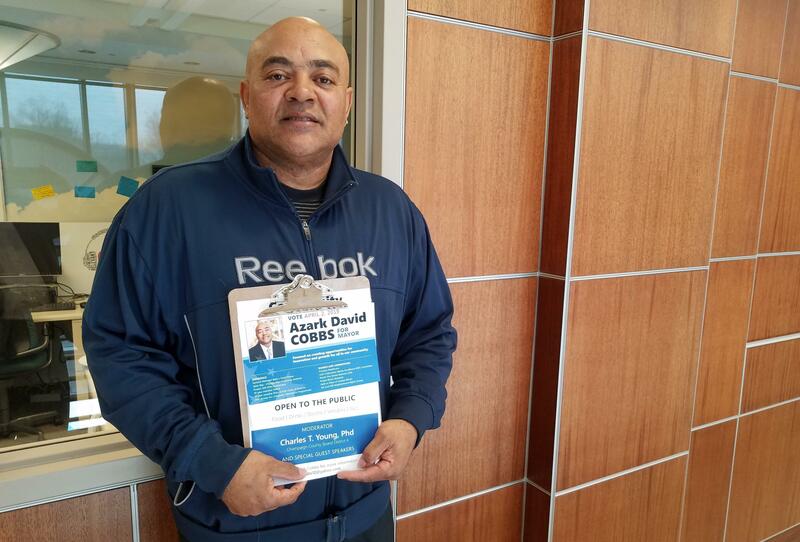 Azark David Cobbs is a past candidate for the Champaign City Council and Champaign Unit Four school board. But this time, he’s running to be the mayor of Champaign. 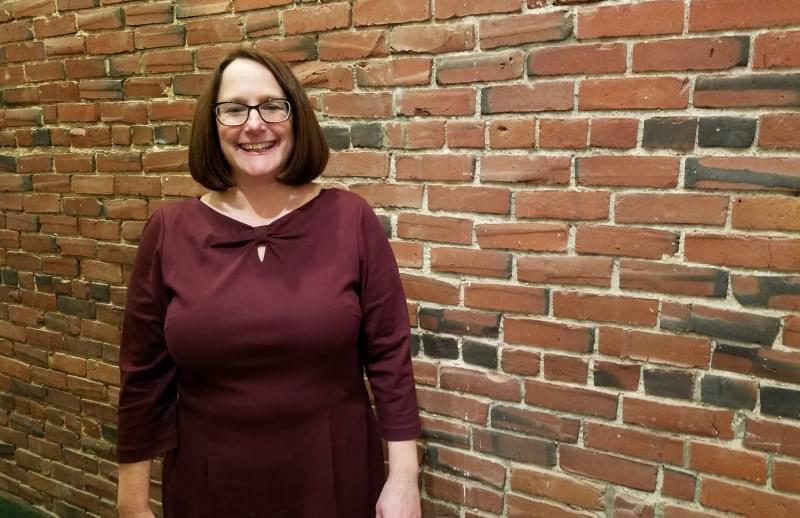 Cobbs: Mayor Deb Feinen. You know, I love her to death and everything but she's for the status quo. She’s for big business and everything. We need a little help in some of these other neighborhoods. We need to bring the whole community up. We need to lift everybody up, because when you've got a government -- when you’re a CEO of a company and you’re only burning on 70 percent of your productivity, and you’ve got another 30 percent out there, that's not success, that's mediocrity, in the business world. So we’ve got to get everybody involved, because these people are consumers, they're taxpayers. You know we’ve got to give them what they want. We've got to bring something to the table. And as Mayor I want to bring everybody into this picture, so we can start transforming. And one of my platforms is arts and technology with my background. JM: Tell me tell me a little about that, about the arts and technology. Cobbs: My background is pretty much technology. So we want to bring it so when we got 74, we got 72, and we got 57. When people come down, I guess, say 50 percent of our students come from South Chicago. JM: And you're talking about the three interstate highways. Cobbs: Three interstate highways. So we're blessed to be surrounded by three interstate highways with a beautiful top 10 university, (the University of) Illinois.. So when people come off the highway, when they look at Champaign, we want (them) to say Champaign is the gateway to tech arts and technology. We want (them) to be able to spend money. You know when it comes to the game, we want to be family-friendly. We don't have all of that. We're not family friendly right now. We have everything else, but we don't have things that kids can do. And that's what we need to get back to. We can make money, and the Chamber of Commerce can make money, and everybody can be happy. But we ‘vegot to get back to the values that Champaign stands for. JM: Now you first ran (for public office) in 2006. So you've been looking at what's been going on in Champaign for several years now. What's your view of how city government is performing? Cobbs: When I jumped on the scene in 2006 to now, we kind of stagnated. And we’ve got a great economy, but it seems not be reaching down to everybody and pulling everybody up by the bootstraps. So I see the tradeoff on that. And then we've got crime. We have a big issue with this crime problem. For the last 10 years, it's been going up. JM: So as mayor of Champaign, looking at the crime problems and the gun violence in this city, what do you think needs to be done that isn't being done right now? Cobbs: Well right now, we’ve got to put the money we've got --- we've got to get more bites in these programs. We allocate the money to the programs, but the programs are long-range policing programs, that take a lot of time to mature. We need programs that are going to solve our situation right now, that's dealing with you know the gun violence that's going on now, which is basically number one ---jobs and responsibility. JM: How can you put something together that would have an immediate impact, especially when you're talking about things that would encourage jobs? Cobbs: First thing I would do, we’ve got to change the whole conversation of how we go about approaching this particular issue. We know we have some tough guys out here, so we’ve got to get more community policing. We've got to get the police in the neighborhoods. We’ve got to get them out of the car. We’ve got to get all these abandoned houses. We’ve got to maybe, turn one of them into a substation that elderly folks can come out, and walk and enjoy life a little bit. JM: So one of the things you're talking about is a police substation in perhaps, one of the more troubled neighborhoods, where the crime is happening? Cobbs: Exactly. They put him in there, and just their presence alone, just the police alternating in and out of there is going to deter, probably 50 percent of the crime in there. Because nobody is going commit a crime, when the police are a block away. JM: You've made affordable housing one of the issues that you want to address. And this is certainly a time where there's a lot of building going on in Champaign for residential housing, especially student housing near the university. What do you see in terms of truly affordable housing in the city, and how is all that new construction affecting it? Cobbs: Well it has a devastating effect on the community over in (Champaign City Council) District One. Because for so long, the university enrollment is up and the basic thing, there's not enough housing. But the closest thing (to the) university, Fourth Street, Fifth Street and Sixth Street, is just that the neighbors are looking over (their shoulders) ---- all the real estate, you know. The property has basically gone to the banks and real estate (firms). And people are worried about the community. One of the oldest communities in Champaign and it's been kind of uprooted for student housing. And people know that, but the people in the community need affordable housing. We've got (the construction of) Bristol Place going on, but there's much more need for more. JM: If there's one theme I'm hearing discussing, in what you want to do as mayor, it’s that there's a part of the city that's not really being served, that's being left out of the growth and the benefits that Champaign has enjoyed over the years. Is that right? Cobbs: And that's exactly what I'm saying. We’ve got a District One, but we need lights, we need drainage. JM: And District One, we're talking about largely the northern section of the city, a historically African-American section of Champaign. Cobbs: Yes sir. Which is over in Fourth Street, and Garden Hills, all District One over there. And we've been waiting. I'm 61 years old, but we’re waiting on some change. We’re on lights, we’re waiting on drainage. We’re waiting to solve the crime problem. We’re the last ones to get mail, and this has been going on for years. We've got mail carriers that deliver the mail at six-thirty, seven-thirty at night, with night lights on, just to finish the shift. So we’re last on everything in every category of the city. JM: What did you think of the city's handling of drainage problems in Garden Hills? Recently, the city council voted to buy land in Garden Hills for a future detention pond as part of a big drainage overhaul. But it's going to be another 10 years before the drainage actually comes in. You're buying the land now for a project that starts in 2030. The current mayor has told me even that's an improvement from what had been even later than that. Is 2030 acceptable to you? And if it's not, what can the city do about it? Cobbs: Too little, too late. You know they promised us the drainage. But then, with the shuffling and everything, they forgot about that, and now that Garden Hill's the issue, and we’re ten years down the road. Man, we've been waiting all our lives … And you've got to wait ten (years) before we get back to it. We want some action right now. We want to see the bulldozers and the construction crew in our neighborhoods for a change. You know we don't want to be the last on the list. JM:: So, if you become the mayor of Champaign, what can you do about it? What can you do about the general problems at Garden Hills? What can you do about speeding up the drainage project which (would cost) 56 million dollars? You've got to have the money to do it. Cobbs: Well we're going to look for some help. Maybe the governor can help us. Maybe we get the state. But we have to relook at how we allocate money, and where we shift it. And we've got to bring some money back and own these projects here. We've got to look at projects that are way out there in la-la land. We’ve got to look at projects that are going to help the community right now. Right now I know it's 50 million dollars for that particular project --- we gotta allocate the money. But we've got to do something. And as mayor I will make sure that Garden Hills is somewhere. That ten years, that's got to come off. We have to renegotiate that ten years.